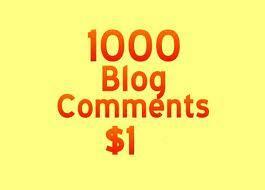 I will create 1000 backlinks for your website using blog comments in max 5 days for just $1 ! Great for increasing your SERP (search engine results page) to get better position in search page results ! You can provide unlimited websites and unlimited keywords, great to create link pyramid, use this service as tier2 for your backlinks. If you need more backlinks check my extras ! create 1000 Backlinks for Any Website using blog comments is ranked 5 out of 5. Based on 375 user reviews.